The weekly chart of emerging markets (EEM) is one example of the widespread “we should be open to adding to the growth side of the portfolio in the coming days/weeks” look. Most breakouts and MACD crosses occured last week after the Fed meeting (see S&P 500 chart here). We should also keep in mind, the trend off the 2016 low was stronger than present-day trends, and even with the more constructive profile, stocks ended up retracing 115 days worth of gains in 2016 before resuming the bullish trend. Our purpose is not to forecast any outcome in 2019, but rather to highlight the uncertainties associated with weak market profiles. 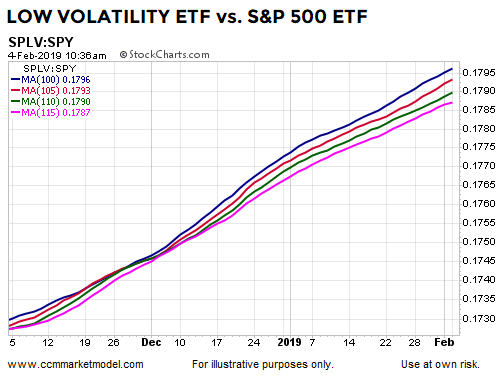 The S&P 500 Low-Volatility ETF (SPLV) overweights more defensive-oriented sectors. 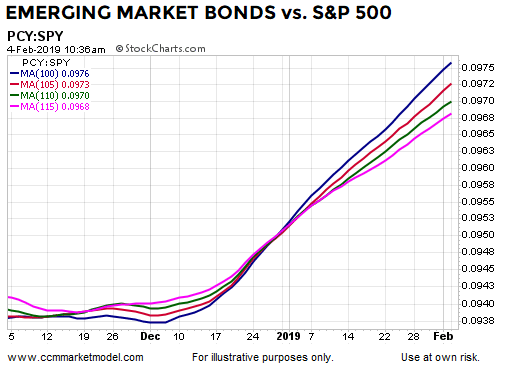 The chart of SPLV relative to SPY looks quite a bit better than the SPY chart in isolation. Two weeks ago, SPLV beat SPY by 0.57%. Last week SPLV beat SPY by 0.87%. The chart below may roll over soon, but right now we have not even seen much in terms of change. Even after the big rally off the December 2018 lows, many of the leading ETFs still have a defensive/income bias, including REITS. The strength in emerging market bonds (PCY) is due, in part, to the market’s expectation the Fed is done or nearly done raising interest rates. The “turning up” look on the chart of emerging market stocks relative to the S&P 500 also reflects shifting expectations relative to the Federal Reserve. Fed actions also impact expectations related to a weaker U.S. dollar, which can be a driving force behind increasing relative demand for gold-mining stocks (GDX). The market’s profile and the still mixed messages coming from asset class behavior do not allow for high conviction regarding any option at this stage, which is reflected by (a) the small % stakes in each of our positions and (b) the high cash position we still hold. On the other end of the spectrum, the data in hand does not warrant a 100% cash position. 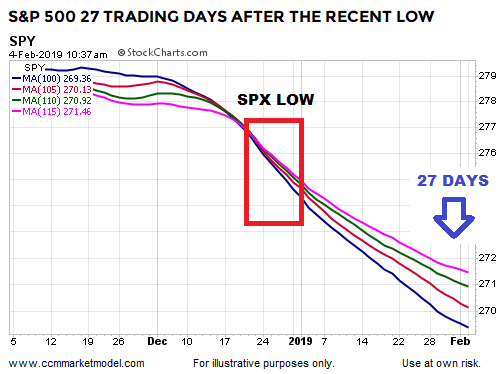 As the data evolves, some additional clarity should emerge, allowing us to add to the successful positions and trim any laggards in the coming days, weeks, and months. Today’s profile is weaker than at a similar point following the February 2016 low. Many of the initial 2016 “rush to get in” gains were fully retraced months down the road. A common question might be, “doesn’t Brexit skew the 2016 case?” The answer is no; the market was pricing in expectations for all events in 2016, just as it is pricing in expectations for all future events in 2019. It is quite possible we will not know the reasons for the still-weak profile in 2019 for many months; it may be that economic data will begin to deteriorate noticeably between now and spring. All TBD. 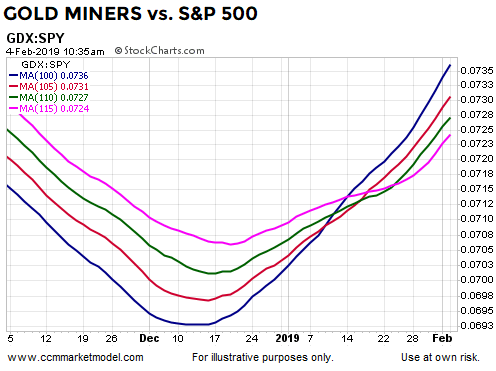 In addition to the improving momentum look on a substantial number of growth-oriented weekly charts, this week’s video covers numerous data points telling us to remain open to better than expected outcomes in the days, weeks, and months ahead. …and some very bullish and encouraging data points. Emerging markets were one of the first markets to seriously roll over in 2018; it is possible they are trying to lead again, but in a more constructive manner. All TBD. Newer PostHow Bad Could It Get For Buy And Hold Investors? Older PostIs The Stock Rally Skating On Extremely Thin Ice?